Francois Gabart's new MACIF maxi-trimaran is taking shape. Construction of all the parts of this gigantic puzzle has finished at CDK Keroman in Lorient, and now the assembly and finishing process has begun. The whole team is looking forward to the launch scheduled for late June. Construction of the maxi-trimaran began in early 2014. Among the substantial work still ahead is attaching the floats to the crossbeam, although painting has already started transforming the maxi-trimaran into the MACIF colours of blue, green and white. The installation of the fittings and deck gear has also began. François Gabart is pleased to see the platform almost complete: "It now looks like really a boat. If I stand in the cockpit and close my eyes, I begin to see how I'll do manoeuvres, which until now has been very abstract." In early June, two innovative and essential parts for the safety and comfort of the crew are to be fitted: the cabin top and the cockpit cover. These are among the many innovations in this new trimaran MACIF lies - 'hut', ie the skipper's living and navigation cell. It will be installed in early June on the cockpit and will be located at the rear of the boat, on top of the central hull - not inside as is usual on large trimarans. "The idea is for it to be part of the cockpit," explains Antoine Gautier, head of MACIF's in-house design team." We wanted to optimise the boat for solo sailing by combining all operations in one place. The objective is that Francis is not obliged to run ten meters between the winches and the helm. So we have installed five winches side by side in the center of the hull, behind the rear link arm between the two wheel steering positions. And to further facilitate the movement we have installed a cabin in the rear of the cockpit behind this. This allows for the cockpit and the 'living pod' to be on one level - like a caravan on top of the boat. "A watertight door separates the two spaces, the cabin will house the bunk, computers and electronics, but also the gallery." Gabart will store in here food and clothes for about ten days, and as a result there will be very little stowed below in the central hull. Cockpit and cabin will also be fully covered with a 12sqm roof, protecting the skipper from the sea and wind. "This is a critical safety component, but also for comfort: The more you are protected, you remain more lucid and efficient," said Gabart. On top of the 'roof' solar panels will be installed. "In the first configuration, the steering stations are behind screen, but not under the roof," explains Gabart. "We will then see if we need to cover them too." Gautier adds: "This does represent added weight, but weight invested in comfort, is also a performance gain for François." Meanwhile the foils have also been revealed with lateral foils built into the rudder. Gabart says: "This will certainly allow us to go faster, but mostly to navigate in a more stable and secure way. 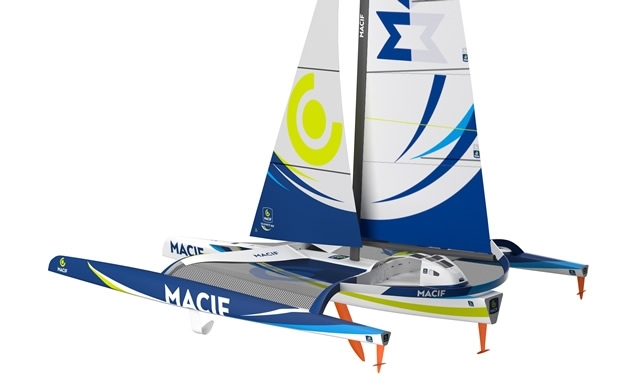 The MACIF trimaran will be very versatile and it should go very quickly when conditions permit."